I'm tired of gritty, grumbly first-person shooters. A game that mixes Tron's synth-y style and Bulletstorm's focus on creative kills, though? Now this I can get behind. The game in question is called Desync, and I can't say I've seen another shooter that looks quite like it. The world is clean and easy on the eyes yet drenched in gooey neon. "Use your weapons and movement masterfully to unleash an Attack Sequence—special moves that deal great damage and bonus effects. Launch an enemy off the ground with a well-placed explosive, and then hit another one while they're in the air. Be creative and discover new Sequences, then store them in your AS-Journal." 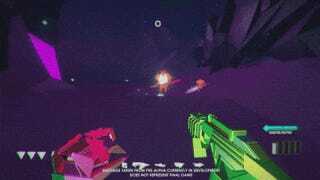 "DESYNC goes beyond the norm of FPS games and tracks all of the actions that you make. Including movement mobility, situational awareness, accuracy, mouse movement patterns, attack variety, and much more." Creative attack sequences score you more points, and the game's difficulty/pace adapts to how well you're playing. If you're an unrelenting bull-in-a-china-shop gunmonster, Desync will up the ante to make sure you're still being challenged. So basically, it's a score-based shooter with a dash of Bulletstorm thrown in for good measure. Desync will be out on Steam next year. Between this and other games like Devolver's Heavy Bullets, I'm actually pretty pleased with the hair-dye-and-tattoos direction first-person shooting's alternative scene is taking. Crazy art styles, smart spins on classic gameplay, and not a grumpy space marine in sight. The future is bright. And neon.